The June rain figures are out, and as expected, the country as a whole is in deficit of -46%. Quite a huge deficit, considering the fact that June is the main month of rain and gets around 25% of the season's amount. The figures are:Actual: 92.6 mm, Normal: 171.2 mm and Departure: -46%. The sub-divisionwise weekly and seasonal rainfall distribution is presented in enclosed map. This shows only 1 region in the mainland as +, that is Rayalseema, and + in Lakshdweep Islands. Huge areas are seen in deficit or scanty shades. The June of the last 5 years has been much better off. The June percentages from 2004 to 2009 were:-2%, -20%, -21%, +20%, +21%, and -46% this year !! In Maharashtra, specially the inland regions, the deficit is alarming. -60% in Marathwada, and -50% in rest of the regions including Konkan. Rains in Mumbai are at 50% of the normal,( S'cruz at 40% of normal), and Mahableshwar( a key area for the catchment of 5 rivers) has recieved only 20% of its normal. In fact, the total for June in Mahableshwar was only 166mm (normal is 800mms). This is the lowest ever June total for this hill station, the previous being 194 mm way back in 1891 ! I have just recieved rainfall for June from Cmdr. Potey for Lonavala (hill station 100kms from Mumbai). 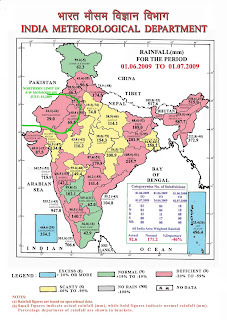 June rain: 2009 =175mm( -85%). 2008= 1187mm. Normal= 1200mm. ( my estimate). Thanks Cmdr. In fact, in my previous blog, I had anticipated a low rainfall for Mumbai this week, Monday thru Thursday. I imagined the city would recieve 20-25mm per day. But, on these 4 days, Mumbai got an average of 10 mm only. Diagram shows the measly rain per day. Now what? There is some positive and bright news. IMD, and some international forecasting models predict a definite Low in the bay, and the Arabian Sea around the 6th. of July. I feel, if this happens, and in all likelyhood it will, it will boost up rains in most of the deficit regions. Strong wind flows from the Arabian Sea and the Bay of Bengal are expected to originate with the formation of the low-pressure areas around this date. The Bay ‘low’ is forecasted to move west over land towards central India and most likely to merge with the system in the Arabian Sea, raining heavily all the way. Entire central India, north peninsular India, Madhya Maharashtra, west coast,M.P. and Gujarat can recieve good rains along the path. On Wednesday, the Australian Bureau said " more evidence of a developing El Nino event has emerged, and that computer forecasts show there’s very little chance of the development stalling or reversing. The Pacific Ocean sea surface is currently significantly warmer than the long-term average across most of the tropical Pacific." But, I feel, it may not affect our monsoon, not till August end, at least. 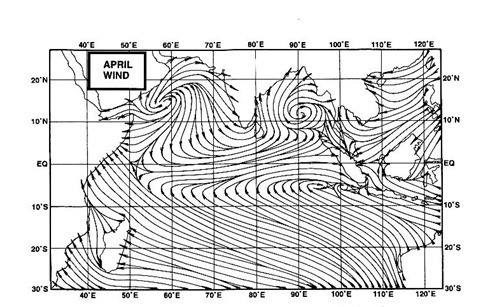 An interaction of westerlies and easterlies around the Bihar/East U.P. region is precipitating heavy thundershowers. But these are short lived, and not expected to cause much damage.Once the lows from the peninsula seas get "in line", the easterlies will slide south towards central India along with the monsoon trough. An eastward-bound MJO wave is already impacting the monsoon. It has "livened up" the coastal trough, as seen in the sudden surge of heavy rainfall events over the west coast. Hence hopes of quick revival, that is around the 6th. is more likely now.